Ever wondered how exciting the taste of cinnamon, coconut or papaya is for a baby? The world’s first ‘baby thrill-o-meter’ was unveiled today to capture and measure the thrill experienced by little ones when they try new and different foods. Created by baby and toddler food experts Ella’s Kitchen, in partnership with Thrill Laboratory, the study provides a unique insight into babies’ physiological reactions when they try a variety of different fruits, vegetables and spices. The results from the thrill-o-meter also revealed a list of the top 10 most exciting tastes for babies, including red pepper and papaya. The results were calculated by analysing increased Galvanic Skin Response from certain foods, combined with facial expression and body language analysis from parents to determine how positive the response was. When babies become excited in response to a food, or the anticipation of a food, their bodies and minds get ready for action. Their hearts beat faster, their eyes open wide, and their breathing quickens. One physiological effect of excitement and sensorial engagement that can’t be seen by parents is the micro-fluctuations in sweat levels, which the thrill-o-meter closely monitored through Galvanic Skin Response. A rise in Galvanic Skin Response, together with positive facial analysis from parents, expressed just how excited the baby was when tasting the food. 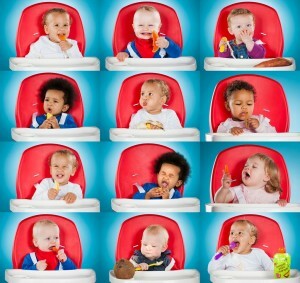 Paul Lindley, Ella’s Kitchen founder and Ella’s Dad comments: “To see little ones’ faces light up when they try a food that really excites them is fantastic and we create all of our foods with babies’ taste buds in mind. From the pinch of spicy cinnamon in seriously comforting Cottage Pie, to Zingy Lamb Cous Cous bursting with exotic mangoes, at Ella’s Kitchen understand just how important it is to thrill babies with exciting tastes at each and every meal, to ensure they develop healthy eating habits that last a lifetime and grow up to be good little eaters.